Weather - what is happening in a particular place at a particular time, usually over short periods, hours or days, e.g, rain, blizzard, sunny and calm. Climate - the average atmospheric conditions over long time periods, weeks, months, years. 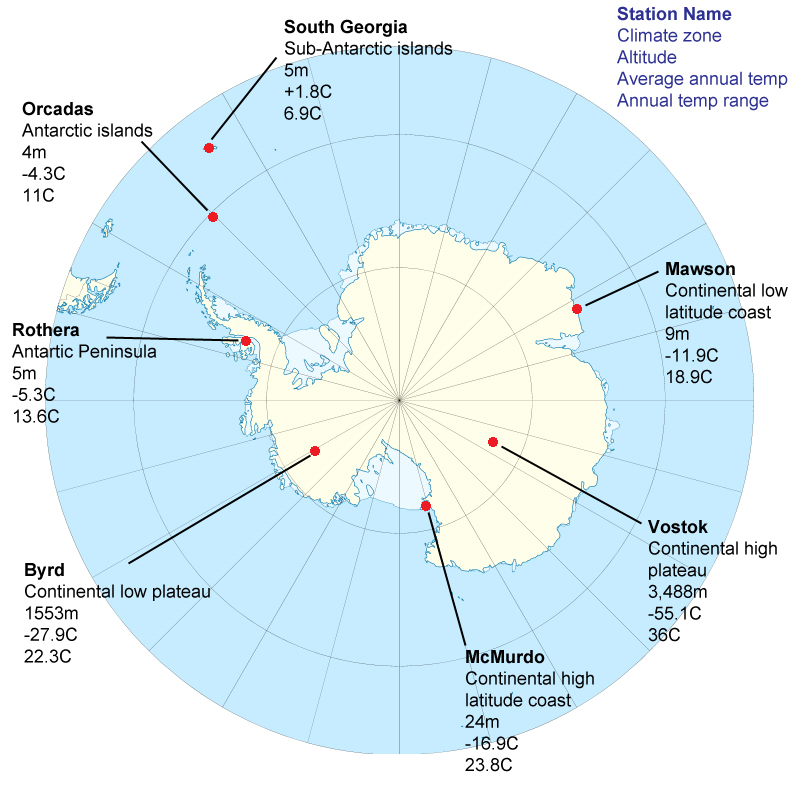 What is the climate like in Antarctica? Near the South Geomagnetic Pole and Southern Pole of Accessibility, deep in the Eastern Antarctic Ice sheet. Inland on the West Antarctic Ice Sheet, approx. 660km (410 miles) from the nearest coast. On Ross Island in the Ross Sea very close to the continent in a deep southerly indentation. On an isolated rocky outcrop on the coast in MacRobertson Land, west of Australia. Fairly typical maritime climate, cold winter and warmer summers. The western side of the Peninsula is warmer than the eastern side. Due South of South America, separated by the Drake's Passage. Islands at all points around the Antarctic Continent, more concentrated in the region of the Antarctic Peninsula. A relatively small number of oceanic islands distributed around the Antarctic Continent. 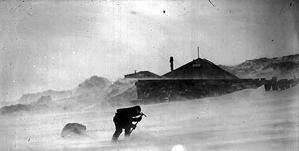 What sorts of weather does Antarctica experience? 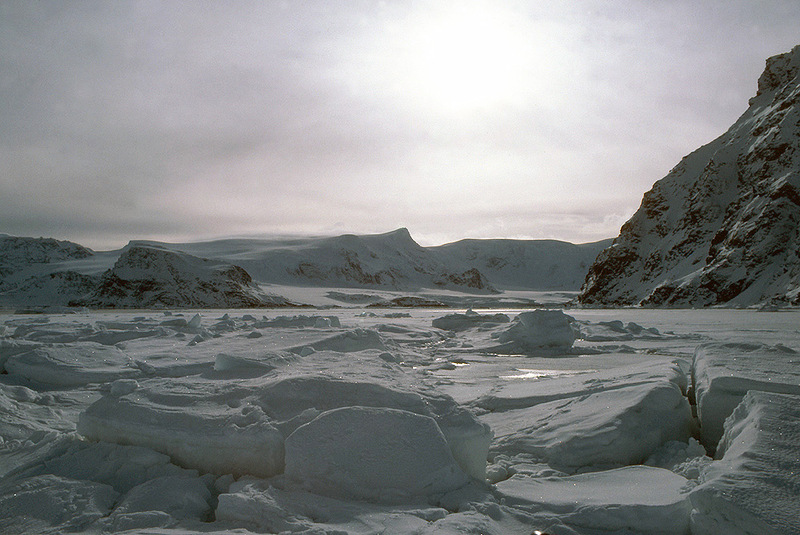 Storms are common in Antarctica and are frequently very energetic and dramatic. Between 50°S and 60°S the Westerly winds are driven by the pole/equator temperature gradient. Below 60°S winds are largely katabatic, this is a result of cold air forming over the pole and falling (as cold air is heavier). The pole is on a high plateau 3,000m (10,000ft), so the cold air falls down the slope getting faster as it goes. By the time it gets to the coast, the earth's rotation (Coriolis force) makes the wind westerly. Estimations of cloud cover has been problematic in Antarctica as the whole landscape is difficult to estimate and features that may seem a few km distant can actually be 50km or more, this makes cloud height estimations particularly difficult. Cloud cover averages may be 6/8 or 4/8, but the reality is that often cloud is either 0/8 or 8/8 i.e. no cloud or total cloud. Coastal areas are cloudier than continental areas and continental clouds are often made up entirely of ice crystals rather than the mix of ice and water vapour at the coast. Most precipitation falls as snow in Antarctica. Constant strong winds make measurement of snow fall very difficult as once it's fallen it then blows around an awful lot without any extra being added to any one position. It rarely comes down vertically making it hard to catch and measure it. Precipitation is often measured as "water equivalent" the amount of water that would be obtained if the snow was melted. The high plateau of East Antarctica is a desert with less than 50mm of water equivalent falling per year, this does not fall as snow but as tiny ice crystals in the air known as "diamond dust" from a perfectly clear sky and causes many optical phenomena such as solar pillars and haloes. The heaviest snow falls are on the western coast of the Antarctic Peninsula. Rain commonly falls in coastal regions in the summer. A combination of high winds and blowing snow, the snow may or may not be falling from the sky. When snow falls in low temperatures, or when ice crystals in the air settle, they are only very loosely bound together and so may be blown around for a long time, the result is that there is often blowing snow in Antarctica without there being very much precipitation. A blizzard may easily lead to white-out conditions when it is impossible to see surface features, the whole world is just a big white blur, this can be very dangerous as it is possible to walk over a cliff edge without even being aware it is there. The contribution to global weather is actually very small, Antarctic weather keeps itself to itself most of the time, there is a much greater influence from ocean currents than from atmospheric effects. This contributes to Antarctica being so cold, as the weather goes round and round the continent rather than spilling over to lower latitudes as the arctic weather systems do at the other end of the planet. A greater influence is from the Thermohaline circulation. Thermo - heat, haline - salt/salinity. Very salty water is denser than less salty water and will sink beneath it, colder water likewise is denser than warmer water and sinks beneath it. Around Antarctica very low air temperatures cause surface waters to cool, become denser and sink beneath the rest of the ocean, this falls to the bottom of the sea and then starts to flow northwards (a similar thing happens in the Arctic flowing south). It is important as means that there are deep currents moving sea water around the oceans that are independent of winds. This moves huge amounts of heat around the planet largely independent of surface weather (although surface weather initiates it) these currents can take 100's of years to reach their destination. What is the circumpolar vortex? The "circumpolar vortex" is a strong Westerly circulation of winds that builds up during the winter months in the upper layers of the atmosphere (stratosphere) over Antarctica. They cut off the central Antarctic weather from the rest of the world causing temperatures to fall and stay low. It also adds to the breakdown of the ozone layer by trapping clouds called "Polar Stratospheric Clouds" that cause ozone depletion by (also trapped) Chlorine containing compounds (such as chlorofluorocarbons - CFC's). 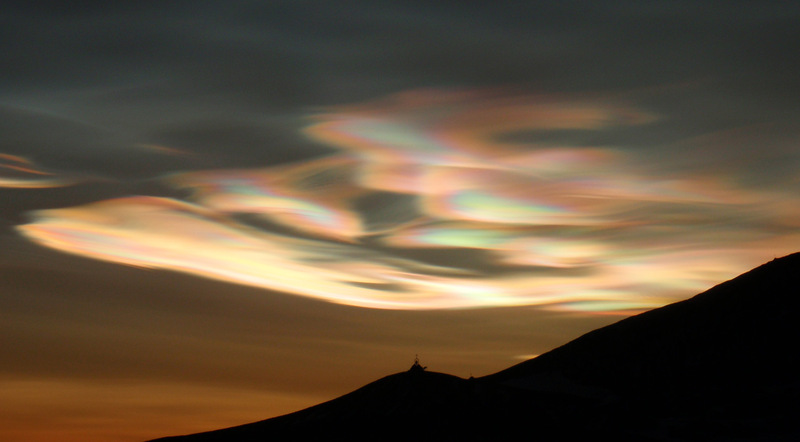 These clouds may be called "Nacreous" as they look like the nacre of shells or mother-of-pearl. The circumpolar vortex breaks up in the spring and summer months, it maintains very low and stable temperatures in the winter. A way of saying that hot things cool down! At night the warm earth gives out infrared rays that cool it down, it also happens during the day, but we don't notice it amongst the warmth from the sun, it only really causes a temperature drop at night. It's this that balances the heat coming in from the sun, so the planet doesn't just keep getting hotter and hotter. Clouds and water vapor in the air reduce infrared cooling by trapping the rays in the atmosphere. Dry air and a lack of clouds allow the rays to escape, which is why deserts can get very cold at night while they are very hot during the day. It's a measure of the energy needed to raise a standard amount of a substance by 1°C, usually given in Joules, could be calories. e.g. the specific heat of water is 4.2 J/g °C - it takes 4.2J to raise 1g of water by 1°C. 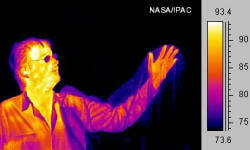 The specific heat of ice is 2.1J, air 1J, iron 0.45J. The higher the number the greater the amount of energy the substance can store and the slower it will cool down. Water has a high specific heat capacity, this means that it has a large influence on local weather, cooling or warming the surrounding land and keeping temperatures more even and constant. 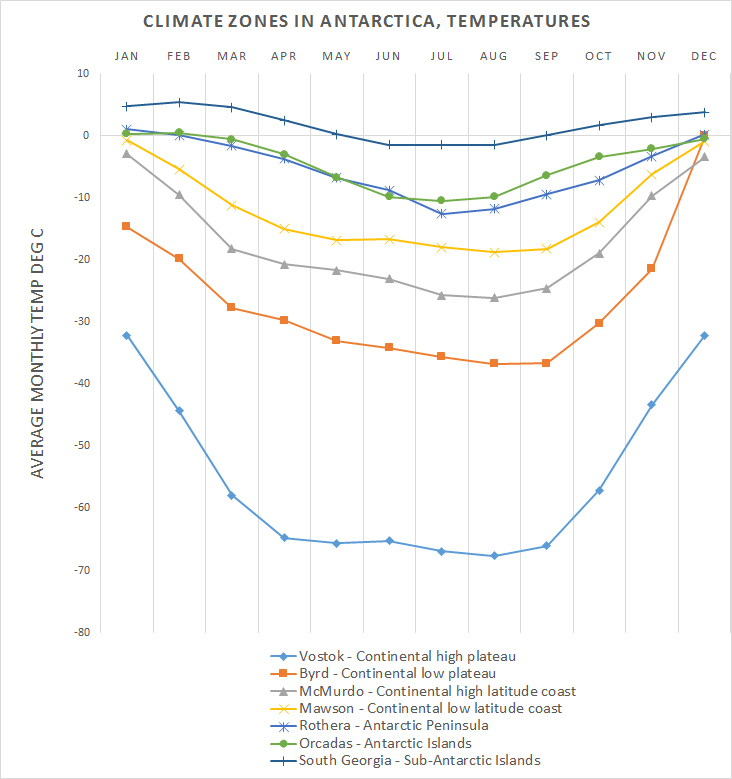 If you look at the climate zones map at the top of this page, you will see that coastal areas generally have smaller temperature ranges over the year than inland areas. This is partly due to the high specific heat capacity of the surrounding or nearby water. What are the characteristics of Pack ice? How does it affect the climate? Pack ice is floating ice that is frozen sea-water, it may have formed in situ, or may have floated from many hundreds or thousands of miles away.It can be open-pack or closed-pack, depending on how pushed together the pieces are. It can last a year or less, or may be old ice that has survived 2 or 3 years before being broken up and drifting off. It forms each year from the sea and melts back into the sea so it does not contribute to sea-level changes, but has a major impact in reflecting light and heat from the sun. More pack ice makes it colder, less makes it warmer.